Ultimate Mode is a completely different way to play Simulation Theory, it directly integrates the story and history of the different Realities together with the gameplay. A single reality is used in one session of this mode. Scores are persistent from session to session. In Ultimate Mode, players need to complete various quests, unique to each Character, to gain treasure and Ascend to the next Reality. As they complete quests, players can discover part of the backstory of their Character and the lore of Simulation Theory. Players can choose to take different paths through the quests to unlock one of four unique outcomes per character. Ultimate Mode also has Events that take place throughout the game for players to solve together. When an Event is completed, only the player that contributed the most gets a reward, but if an Event is not finished in time, everyone will need to face the consequences. The final Event in each reality is an interactive boss fight against one of several different potential boss encounters per Reality - the choice of which boss depends on player decisions throughout the game. Note: These rules assume players are already familiar with the Challenge Mode and Comepetitive Mode rules – the basics of Simulation Theory are assumed here. additional tokens included with the game. Choose one reality. Take it's challenge deck. Find and remove the boss card, shuffle the challenge deck. Place the boss card at the center (3,3) position on the 5x5 board and fill out all the other spaces with the challenge cards face-up on the board from top to bottom, starting left to right. Reveal the top card of each coordinate deck - showing a pair of coordinates - row and column. Randomize the purple generic tokens face down. Take a purple generic token and place it face down (without looking at it) on that position, on top of the card occupying the card at those coordinates. Then shuffle both coordinate decks face down. Do this eight times. The major events mark the time passing inside that particular reality. When the game starts, reveal the first major event of that reality (ACT1) and follow any instructions listed. Each major event card has a time track to indicate how much time (in turns) is left before the next major event is revealed. Place the time token on the 0 position of the event card when it is first revealed. At the end of each turn, after all players quest phase has resolved, move the time tracker on the event card to the next position (To the right) when there are no more positions for the time tracker to move at the end of a turn, archive the event card (put it back into the box) and reveal the next event card, place the time counter at its 0 position on its time track and do the same tracking. When an event card is archived - remove all PURPLE tokens from the board. Each major event may place purple tokens down the same way as initial setup. Move the character standee into an adjacent space by specifying coordinates with the dice. The space chosen must be horizontally or vertically next to the standee. A move cannot be made into a diagonal space. Do this by placing the two dice on one of the characters traits on the board (the first to represent a row number and the second to represent a column number.) The character must have a equal or higher trait value to the challenge card in order to move onto it, otherwise they will lose one health. 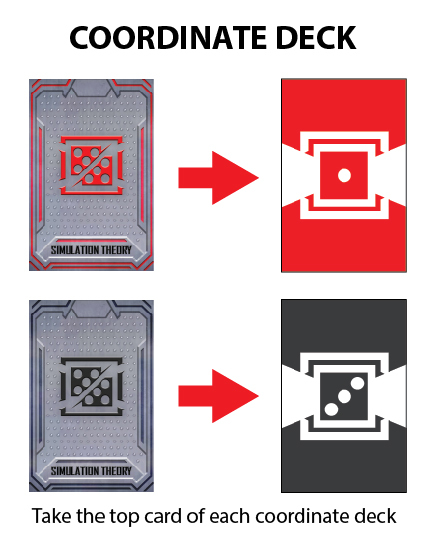 Characters may end up moving onto challenge cards with a token or another standee (e.g. : an npc or another player) on it, if they do, this triggers effects in Action phase. The player gains 1 life and may not perform any other actions this turn. A character that lands on a challenge card with another player/character on it triggers an attack. Step 2: Reveal the quest card being unlocked to all players. The player must show to all players the pattern on the board (which can be interpreted forwards and backwards horizontally or vertically) which matches the unlock pattern of the chosen quest card. Quest cards can be unlocked in any order. Only one quest card can be unlocked per turn. step 3: Once an unlock is done, place the quest card into the player's score pile and then the player may move their standee onto the targeted card. During the quest phase players resolve the story items that are triggered due to the course of their actions. step 3 - go to the ACT (This is the current MAJOR EVENT) currently revealed. story narration - each player should read a different character's dialogue with one player playing the role of the narrator whenever any story events take place. It is up to the group of players who reads which portion. A good practice is to take turns playing the role of the narrator in order to prevent one player from getting tired. for QUESTS: these are the quests that are unlocked and are often narratives from a character's memories/past. step 2 - go to the corresponding "Character Quests" section of that reality and then go to that character's section. step 3 - check the position of the book story tracker token on the character's story card. Go to the same numbered character quest as indicated by the position of the book story tracker. Characters are dealt damage as a consequence of story events or combat. When a character is attacked by another character be it another player character, an npc or a monster/boss with a trait value higher than their own of the same trait (e.g. : A monster attacking with 3 bq attacking a character with 2 bq). That character is then dealt damage.